Each January, I flip through a notebook in which I recorded all personal purchases over the past year, and assess the value. Value to me is whether it was worth the investment, but also, if it gave me good wear and felt wholly “me”. I loosely consider cost per wear but not in an obsessive way. Anything unworn over the past year gets a good, hard look. I bought less clothing in 2018 than in any of the ten years I've been keeping track. I had other uses for the money, and a sense that I could happily wear what I have. Thrift has value built in, but it can be easy to overbuy or pick the "best of the bunch" off a lacklustre rack. These were in new, unworn condition, They are by far the stars of 2018 because I wore them often. A. Heliotrope mohair sweater, George Hogg. I have always liked this bluey-purple and it's hard to find. The brand is affiliated with Bennetton; there are boutiques in France and Italy, so what it was doing in Montréal is a mystery. B. Black calfskin car coat, m0851. Sleek and simple. A zip-in liner is missing, but I wouldn't have used it anyway. I wondered if it came from the store, because it was in pristine condition. C. Black brogues: Italian leather (uppers and soles), with a block heel. I've only once before found new shoes in a thrift, so a major score. Total cost was $45. I donated several items, ensuring good karma. Lesson: When shopping thrift or consignment, ask yourself if you'd buy the item full price (or want to buy it). That's a strict standard, but it is way too easy to oink out on stuff that is "almost". I found the leather coat on a 30C/92F day; that's my favourite thrift tip: look for off-season pieces. I’ve developed a fondness for coats, I see. I used a 40% off coupon to buy a lightweight olive quilted one from Talbot’s. I'm more easily chilled; when once a sweater would have been fine, I now need a wind-breaking coat. Lesson: I had bought a mauve cotton coat from J. Crew a couple of years ago, and wear it only occasionally, because spring is so short here and it looked odd in fall. (It's tenure in my closet may end this year.) Olive works in both of those shoulder seasons. I would not have ordered this online based on this this photo, but in the store, it worked: a little softer than an anorak, just as useful. Is the lesson to order more, just to see? Probably not, as this is a company with fairly high shipping costs. But it did tell me you can't tell much from photos, especially theirs. 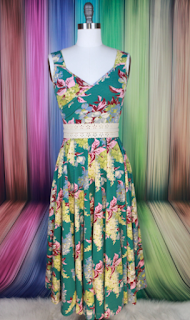 I don't wear dresses often, but in last summer's blazing, record heat, this Hawaiian-print frock winked when I passed by the Toronto boutique Doll Factory by Damzels. That shop is a shrine to rockabilly-pinup girl style, always fun to look in, but not squarely in my style niche. So, I was surprised to like it, buy it, and wear it confidently. On a practical note, the dress is a cotton-blend, washable, and doesn't even need pressing. Lesson: I don't usually buy "fun" clothes, but sometimes... it's party time at the tiki bar! And I got a surprising amount of wear out of it. a blue called Poseidon, a saturated sky blue, in May, in Paris: not a dog per se, but I wore it once before the weather turned warm, and then shrank it in the wash. Though I tried gentle reblocking, it was not going to be long enough in the arms ever again. Yes, I set the machine on delicate cycle, but failed to double-check the spin speed, which has to be re-set each time, dammit. It became a gift to a friend on whom it is divine. Recovery: I bought it again, in Large, as soon as there was a sale. Why? 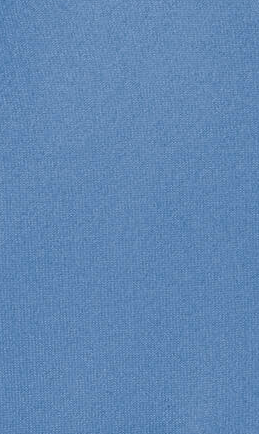 Because I had also bought the matching cashmere voile shawl. Bwwwaaah. So together that was the biggest buy of the year and I screwed it up. Lesson: Check the cycle's reading on my machine every time. This is not the first time I've shrunk sweaters due to over-agitation. Also, I thought hard before re-buying the same item if the original doesn't fit: was I throwing good money after bad? But, I'm glad to have that sweater even if it means I can't buy other things. 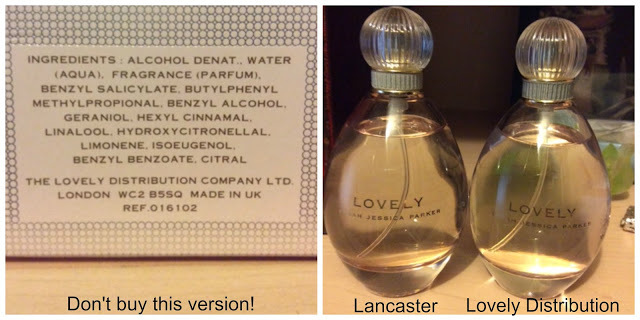 Biggest waste has to be five bottles of Sarah Jessica Parker "Lovely" that I stockpiled during sales, not realizing a change of licensed distributor had tanked the quality. So, while it is authentic, it is not even close to the original. I thought I'd bought only three, but discovered two more hiding, and all were the horrible Lovely Distribution version. Binned; I wouldn't even donate this nasty stuff. Recovery: I found two new scents: Gorilla Perfume's "Breath of God" and Hiram Green's "Arbolé Arbolé", a sublime all-natural, as are all of Green's. I order it in decants from perfumeniche.com. Lesson: When you restock your fragrance, open the new one and try it immediately. You have little recourse if you stow it for months; the vendor questioned my storage method. If you buy multiples, check the lot numbers on each of the others to ensure they are the same as the one you find acceptable. Jury still out: Last October, I bought a pair of Icebug winter boots with built-in crampons, which are under assessment. Hardly chic, but a fall on the ice underfoot here for months terrifies me. In terms of absolute spending, things looked downright frugal, but any urge to splurge was taken care of by delightful "milestone birthday gifts": art, pearls, movie passes, sybaritic experiences. The best gift of all was the company of friends who visited all summer long. Months passed without a purchase unless you count my passion for perfume decants, but I look at that as therapy, pleasure and education all in one. The B is for the thrift-shop bargains, and the minus is for the dumb sweater shrink. It's funny; in retirement, I demand that my wardrobe to work far harder for me than when I went to an office every day! If you are willing to contribute your own "dog", you'll make me feel better, but I'd also love to hear about your most satisfying choices. However we acquire—retail, secondhand, or even things we receive as gifts—it is worth taking time to evaluate how they work. I bought Arbolé Arbolé this year and love it! Thank you. But my spending on personal stuff was a mixed bag and not particularly successful. Some real winners, but a lot of misses. Probably a B- to C+. This year I think I will actually track and make a report, at least to myself. I've probably needed to do this for a long time. I love reports like this, especially since I am too lazy to keep track. My three best: a tencel dress from Monoprix that was cool to wear in horrible heat last summer and an LLBean (!!!!) black maxidress that is perfect for travel. I liked these so much that I did something I've never done before: bought duplicates. Number three (please don't be scornful): we were in the silk market in Spain where most everything is from China. My daughter liked a scarf. I said "OMG that's the Hermes iris scarf." We bought it and I keep getting compliments. 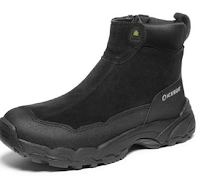 WORST; Some boots from Amazon, which I forgot to return. They were mis-sized. Amazon is the scourge of the economy and I hardly shop there for anything, including books. This purchase reminded me of why I made the NO AMAZON vow a few years ago. GOOD DISCOVERY: Eucalan, a wool wash. You put a few drops in water and swish your sweater around, squeeze it out, and dry flat. NO RINSING. EucaLAN leaves some lanolin in for conditioning. Well, I have been such a blabbermouth--perhaps I need to write more than I have been! As a teacher, I think you deserve at least a B+ because you got that gorgeous coat. This is such a useful exercise. Shoes and boots turned out to be my focus for 2018. So far I'm happy with the boots, I'll have to wait to assess the shoes as they are summer styles. Love the colours though! A couple of duds turned up as I made my list, although I'm not prepared to write them until I've made more of an effort to wear them. Have to remember to cycle through my clothes instead of reaching for the same things. Doing this annually is also a good brake on further shopping as it's clear that I have plenty to wear. Your shift shop finds are amazing. Wish I had the patience to do that. My dog of the year is a smallish Dooney & Bourke cross body bag. I can't say exactly what style it is, since they change so fast it's no longer available on the website. The bag itself is a beauty but it's proven to be impractical for me since it fits my wallet, phone and keys with no room to spare and I scrape my knuckles on the zipper and have to rearrange the three things anytime I want to get one of them out. I don't like huge bags, but I do want something I can use daily and have room for my sunglasses and lip balm with easy access. I suspect I will be selling it this year. My win is a Talbot's denim jacket. I haven't had one in years because they are either too stiff or too narrow and I saw this one reviewed on a blog and decided to try it. Winner! It's not so stiff it's unwearable, fits perfectly (there is a wide range of sizes) and the quality is good. I'm tired of my formula of casual dresses with cardigans, this jacket has given me a great option and looks and feels current. 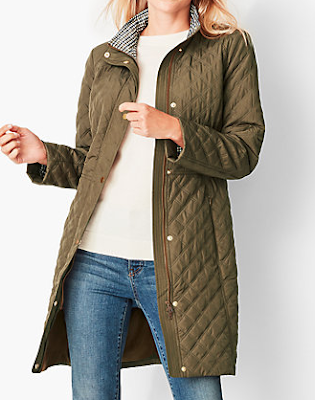 Marla, I've just glanced at the Talbots website, including Duchesse's coat, but there are very few sizes left - I'd need a petite as it does look long for a spring/autumn coat. However I've noticed that they have a "jeans-jacket" shaped corduroy jacket, in several colours. Too bad shipping is expensive and problematic (to Canada) as there is one in a rich red... I've never particularly liked cardigans, at least not on me. Very utilitarian purchases for me this year; doubles of dark wash and black narrow-legged jeans last winter as well as a dark violet-red pair, all at deep discount, and this year a dark-green pair otherwise identical to the red. I had lost weight. Also this year I'm enchanted with (once again two pairs) of fabric Doc Martens mary janes, these days worn inside the house in lieu of slippers - very supportive. A few good tops and t-shirts from Simons, in organic or pima cotton. Most of the errors were from earlier, such as cheap t-shirts from Joe Fresh - in pure cotton but dire quality. I have to go through those and figure out which to keep for house cleaning and which to discard or turn into rags, though not too many rags! I still haven't found a winter coat I like, washable and no fur, fake or real... And there is such a dearth of skirts that aren't minis or pencil skirts (useless on a bicycle). Duchesse's leather jacket is splendid! Mardel: I love all the Hiram Green scents, and confess I feel an extra surge of pleasure when someone says they cannot tolerate "perfumes with all those nasty chemicals" and I get to say what I am wearing is all natural. Frugal: I am all for buying duplicates; one extra is just fine by me. Are you saying that scarf was a vintage Hermès or a counterfeit? Vintage is smart, counterfeits... well I will not use the language here, but I wish persons would not support that form of theft. I've about given up on buying footwear online because if I do it cross-border, I have to pay postage (free returns rarely include international orders.) And boots are heavy! LauraH: The other day I saw a very cool Moschino woolcoat (wrong colour for me) and a sharp men's Ferre sportcoat! But you do need patience and discipline. Lots of very sad low-end merchandise and pilled cotton blends. But when you find something great, what a thrill. Marla: Oh, those bags look so smart but they are not really that functional. The sweet spot for me is a bag at least 10x 12 inches, so I can carry my iPad mini or notebook. Also I find those cute little crossbodies rarely have substantial straps. I have a Talbot's jean jacket that is at least 7 years old and I wear it very often, it's super versatile, well made, washable and comes in both denim and white and usually some good summery colours. Comes in Misses ,Misses Petite, Woman and Woman Petite, too. lagatta: If you view shipping as a problem, sign up for the newsletters and wait for a free ship promotion. (If you have a UPS account, you can also have the forwarding fee, $10, waived by calling UPS with your order number. Ask for a Canadian operator.) It is unlikely that a seasonal garment sold in October will be available in mid-January, in all sizes. Other things like the jeans are in stock year round, but styles and washes come and go. lagatta a montreal - I don't know if shipping costs will be an issue, but check out Title Nine and Athleta for casual skirts that aren't mini and have some room in them. For bicycling, there are swb - skirts with benefits, shorts attached and they are wonderful. I almost exclusively wear skirts and dresses (I'm in San Diego) and either of these sites can't be beat for long lasting quality at a decent price. This time of year the spring selection is just beautiful. Well, you've made me feel better - I managed to shrink and felt a navy cashmere sweater from Pure, which I had only worn a handful of times. I scooped it up with an armful of my husband's dark-coloured sportswear and bunged it in the machine on a 40• wash! There may have been some bad words uttered when I eventually unloaded the machine... We live and learn. 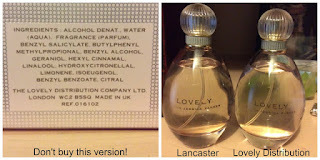 I also made a perfume discovery recently. I tried the reformulated L'interdit (I know, but bear with me) and was very pleasantly surprised. I had always wanted to love the original (because: Audrey) but could never take to it - there seemed to be a note that jarred with me. But the new one does not have that, and is a rather intriguing scent. A small word of warning before using Eucalan. Many people (me, for example) are allergic to lanolin - it's often the reason people can't tolerate cheap body lotions. If you are, it will of course cause a reaction if you wash your woollens in Eucalan. Because the lanolin coats the wool fibres very efficiently, it may be impossible to remove it from the garment without resorting to harsh detergents. So if you're the itchy type it might be worth testing it on something old first, just it case! I would give you an A, on the basis of that M0851 coat alone -- I can't believe you found that AND those gorgeous Italian brogues! I haven't taken the time yet to tot up purchases made last year, but I'm very sure that I bought far fewer pieces and I'm also quite confident that I feel good about all of them (it's entirely possible, I'll admit, that I'm doing some serious memory-blocking, but generally, I think my determination to edit is manifesting in this dimension. A good feeling. . .
As an occasional recipient of your generosity, I thank you for making mistakes! We all do (I think of a $200+ pair of wool trousers in a style that just made me look enormous...ach!) And having seen you in that retro print dress, I can confirm what a great find it was. Thanks for this honest and edifying yearly account! P.S. Arbole Arbole has to be one of the great finds of 2018. I love it. 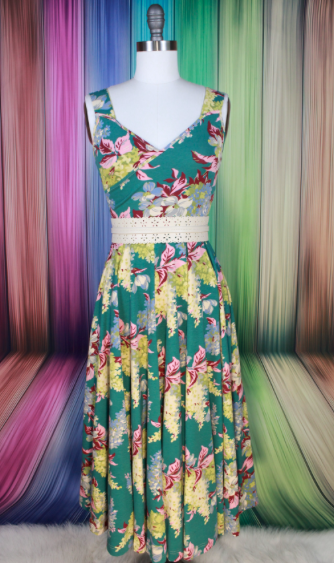 That summer dress is very pretty. I can imagine that style is very flattering. I would give you an A for thrift shop finds! How often do you check in at the thrift shops,and how many different shops do you frequent? I'm thinking that I might have better luck if I were more regular in my visits. I enjoy your annual review since your comments and experiences are pertinent to my retired lifestyle. The comments tempted me since I was anxious to read about the experiences of others as well and, as always, they were filled with fashionably fun thoughts as well. One great little purchase for me was a sweet and inexpensive little floral top from Zacks, a Montreal retailer with shops in my area. It’s a wee bit like thrift or discount shopping so I’m learning to apply the brakes before getting carried away. It’s given me an easy daytime option to wear around the house but also to skip to the grocery store suitably clad. I threw it on the other day and my friend thought I’d dressed up when, in actuality, it just is a nicer choice than a pair of tights and workout shirt for a walk in my new neighborhood. Thanks Marla; there is only one there I find long enough _I'm much shorter than models, it would be at or a bit below the knee. I've also seen some nice travel skirts at a local boutique called Katrin Leblond (no shipping, it's an easy walk from my house). Not cheap, but they have some that look very nice (online) if they have my colours and size. My 2018 star was a pair of Rothy's flats. These shoes are made from recycled plastic, and can be washed and line dried. I got a color I usually wouldn't, a burgundy/purple and to my surprise wear them often. They seem to go with so many of my clothes, and save my leather shoes when it's raining. Since the Washington DC Metro broke the historical record for rain they were a great buy. Marla: Thank you so much for the skirt suggestions, SWB is one of the best names ever. (When I was a kid these were called "skorts"). Wendy: I drop in a couple of times a week on my "health walk" route. There are four to six (if you add consignments) in my neighbourhood, so I vary them. Since it is largely about timing, a quick peek regularly beats an immersive experience occasionally. Just yesterday I saw a pristine Equipment silk blouse for $6.50, but not my size. susayoun: Thanks for mention of Zack's, also very good for outerwear like puffer vests. Jane: Queen of the Utility Jacket! Don't get me started on how cotton interlock pills (and the cost of that that does not); I hope you could return those tees. lagatta: It's always fun to drop in to Katrin Leblond; such a vibrant and personal boutique and Katrin is lovely. I have never seen what I think of as 'your' colours there in a skirt but I have in knit tops, as an artist you will appreciate the palette. Trina: Hiram Green is so wonderful that I'd call it "FBW" as fragrance lovers would say: full-bottle worthy. Unknown@11:37: Thanks for mentioning the Rothy poly knit shoes, there are several brands now that offer these and IMO so much better looking than the first generation of plastic shoes. We all need a good pair of rain shoes! Beth: And I believe that mistake was a little while ago so you may have a pristine record for 2018! 2019's gonna be better for me, now that I have that finicky delicate cycle in my sights. I am still working part-time, and need clothes that are appropriate for professional work, and either dress casual or business attire for the once or twice a month we go out to the theatre or for a concert. STARS: JOSEPH RIBKOFF suit elements: flat front, invisible elastic pull-on pants and skirt, with a classic jacket in black (for work and for more formal evening events) and the same combo in navy (for work and other daytime events). With a patterned top coordinating either with the navy or black, they are suitable for almost any occasion. I have worn these at least 1-2 times a week, and they launder beautifully at home (turned inside out) in the washer and dryer. Great combination of 95% polyester and 5% elastane, which has the unanticipated benefit of cutting out the wind and cold (down to -20) because it is such a tight knit, also the invisible elastic waist is very forgiving of weight fluctuations. I feel I will get a number of years out of this, so the investment is worthwhile. DOGS: Usually I like Olsen for casual/business casual - but I gently laundered a bomber jacket as directed, and it came out shrunken - I occasionally wear it (only at home, and never when my husband is around) just so I feel like I have gotten some wear out of it. Woof!